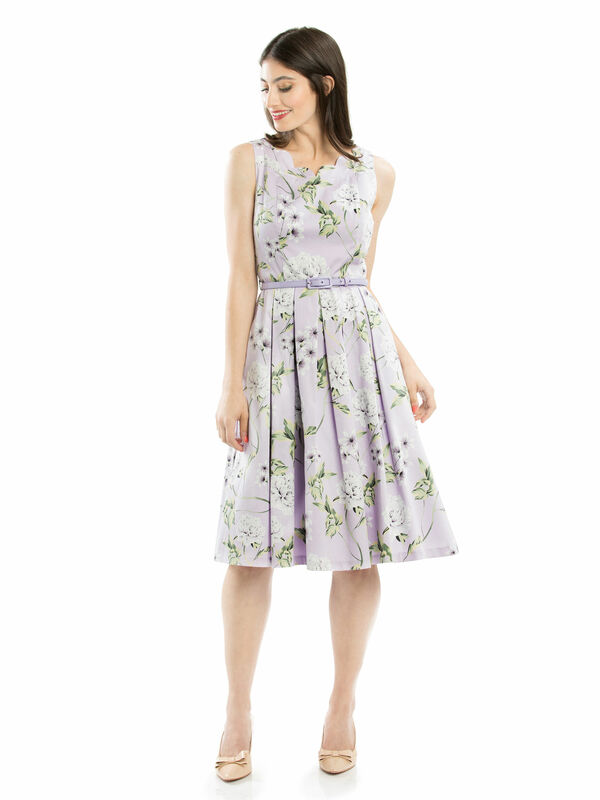 Sweet Pea Prom Dress https://www.review-australia.com/au/sweet-pea-prom-dress-lilac/RE19DR303.REPUR029.html Lovely in lilac, this prom dress brings feminine vintage charm to your collection. 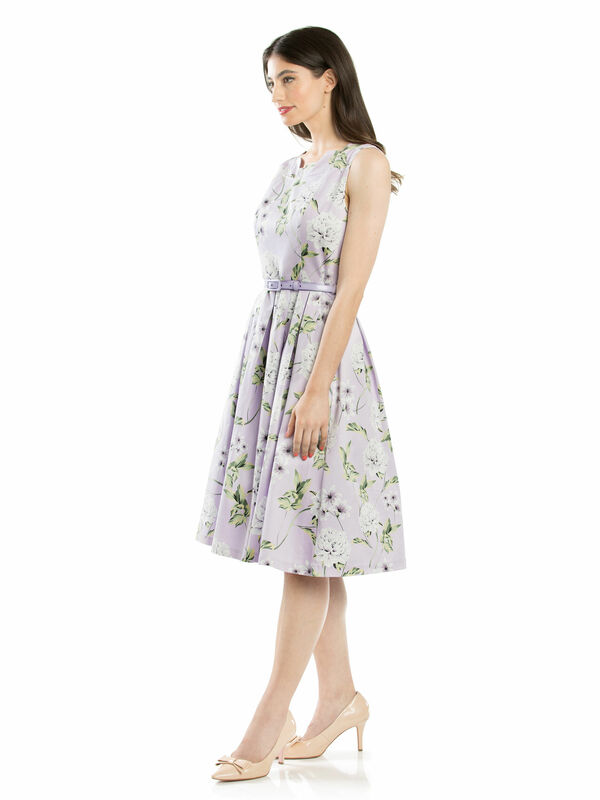 Made in a stretch cotton fabrication, the sleeveless dress features a soft floral print, an a-line skirt with soft pleats, removable patent belt at the waist and a scalloped neckline. 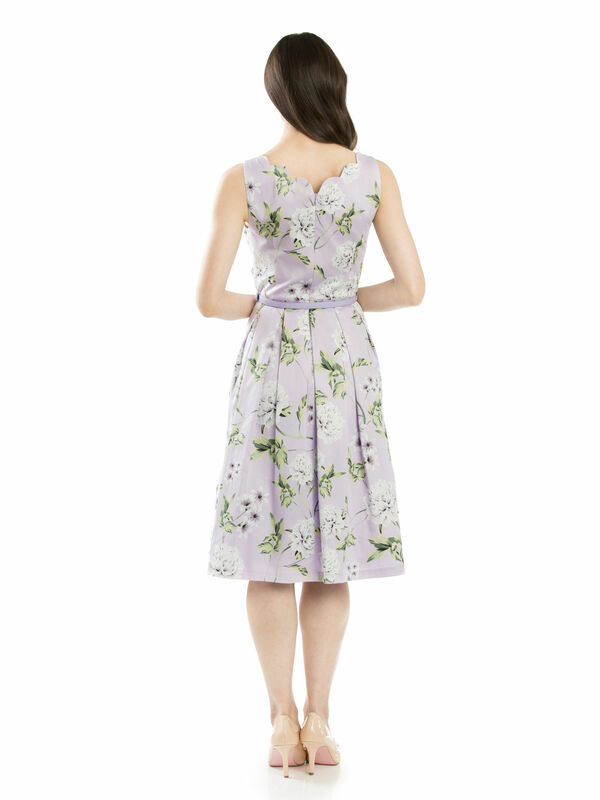 Lovely in lilac, this prom dress brings feminine vintage charm to your collection. 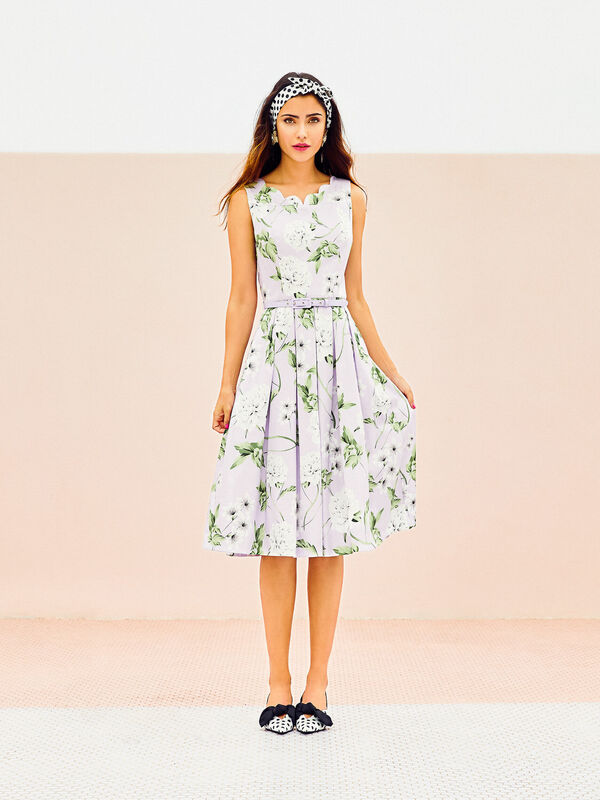 Made in a stretch cotton fabrication, the sleeveless dress features a soft floral print, an a-line skirt with soft pleats, removable patent belt at the waist and a scalloped neckline. Sweet Pea Prom Dress is rated 4.8 out of 5 by 84. Rated 5 out of 5 by AliceK from New favourite dress! My fiance bought me the dress as a birthday present about a week ago and I love it so much. The neckline is beautiful and the material is very nice. It has mesh layers at the end of the skirt to keep the structure and sits beautifully when worn. I am about 164cm and bought size 8 and it is not too long on me. It does seem longer than other review dresses I have but the length makes it look more elegant. The dress comes with a cute belt and has pockets!! The colour of the dress is so beautiful as well and it looks better in real life than the photos online. If this gorgeous piece caught your eyes, just go for it and take it home with you. You won't regret it! Rated 4 out of 5 by i_am.kate_b from Worth the wait! For past 3 or 4 months haven't bought any dresses from review, but then Sweet Pea arrived! It's just perfect for me. The print, the pattern, the colour...everything! I say it's a must have! I understand the problems of some women who aren't happy with the longer prom dresses, and that they will have to find a good seamstress to get it shortened, that's why I've only rated it with 4 stars. If Review would consider a petite size version of every prom dresses then everybody will get to wear their undeniably beautiful dresses. Rated 5 out of 5 by Aprilrose from Gorgeous cut I love this dress so much! The colour is beautiful, the detail on the neckline is divine, and it has POCKETS! I am between a 12 and 14 in most Review dresses however I went with the 12 for this dress, it is a comfortable fit. I would have liked it to be a couple of inches shorter - I am 159cm tall and it falls well below my knees. I am not too happy with the placement of the pattern on the bodice, as it looks unbalanced. I had ordered it online, by the time I had noticed, I had already taken the tags off. Rated 5 out of 5 by Rach82 from Amazing Neckline! I purchased this dress a bit over a month ago and I love it so much. As with all review prom dresses it is beautifully constructed and falls below the knee on me (169cm) which is my favourite length in a dress. The neckline on this dress and beautiful light purple colour is what drew me in. The sizing is pretty standard for a prom dress, I got the size 10 and it has room to move but doesn't look too big. If you prefer a tight fitting dress, I'd opt for a size down. Rated 5 out of 5 by TrinityWears from Stunning dress, picture-perfect neckline I fell in love with Sweet Pea the moment I first saw photos and knew she was one I had to have! The neckline is perfect - feminine scalloped detail and modest enough for work without being too “grandma”. This dress is one of those that looks fantastic dressed up with a lilac or while pair of heels for a wedding or other formal setting, but is equally well suited to a casual brunch dressed down with the Martha sneakers. I know this is one dress I’ll wear again and again! Rated 5 out of 5 by nammiesgal from Beautiful colour! Beautiful print! Beautiful dress Bought this dress online despite me being hesitant about the colour - I felt the photos made the colour dull. Was very happy when I received the item and the colour was more 'vibrant' than what I had imagined. The fit is typical prom style fit - I sized down to a 10. Love the floral and the cut near the neckline is something a bit different from what Review normally does. Overall, a very pretty dress that will go with many colours. Rated 5 out of 5 by Shanegirl from Feminine and flattering! I'm a size 14 and i always find it hard to find dresses that suit my figure. But I just love how this beautiful dress is so well cut that it is flattering around the neckline and bust, pulls in to my waist and then falls gracefully around my hips without making me look like my hips are huge! I love the colours and pattern of the fabric and just love the style. Review - please make more dresses along these lines!